I am happy about this. And even happier that the painting they selected is one of my favorites from the past year. 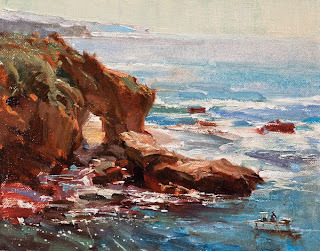 Not just from Octobers LPAPA/Laguna Art Museum Invitational -- a personal favorite from my entire year. 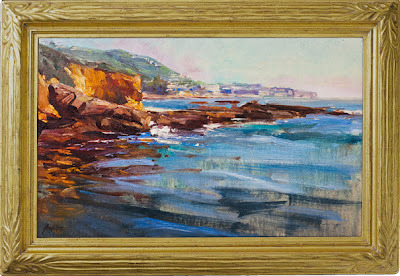 The orange cliff you see in this painting is actually known by Laguna locals as 'the Keyhole' and it is a seaside feature that has been painted hundreds, if not thousands of times over the past 100 years. So when I set up to paint it too I tried to do something a little different and not show the keyhole, which is a small arch that cuts through the cliff before it meets the water. The arch may not be huge, but it is large enough for people to walk through. So of course, they do. And usually painters will put the people in too. Anyway, I digress . . . So I've just sent 'Laguna Gold' down to the show in SoCal and I hope it is well received. But no worries if it isn't. I love that painting regardless, no matter what happens, and if it comes back home instead of finding a new one, well, that's cool. It'll go right back up on the living room wall again in a place of pride. Lots of news here Thomas. Congrats on all fronts! I'm in complete agreement on the judges picks, but I'm certain they were heartbroken to feel the need to exclude the painting of the tree (can't remember the name of it now...). They are all fabulous, but what I loved about the tree was the unique view - how bold and courageous. I'm pleased to have been accepted too - too bad I can't attend and meet some of you! Congrats right back at you for getting work in yourself. Plein air painting is a small world, so I expect we will cross paths something. I love how you paint ocean. Its perfect! Congratulations! It's a beautiful piece. Thanks, Greta. Will respond to your other question via PM. This piece is show-stopping Thomas, so glad for your successes on all levels! What a year it has been for you!